It was a case of pastures familiar at the monthly Municipal District Chamber meeting on Monday as Cllr. Frankie Keena returned to the mayoral seat he vacated at the end of his initial term in 2014. Cllr. Keena received his chain of office from outgoing Mayor, Cllr. Aengus O’Rourke, as the first citizen commences his year long reign ahead of the local elections due to take place in May of next year. In what is a role reversal, Cllr. O’Rourke will serve as Vice Mayor for the coming year. 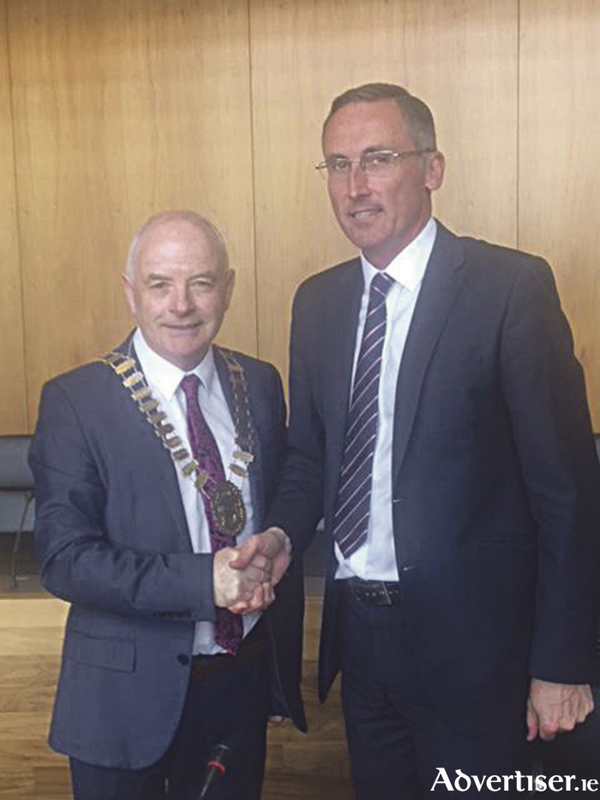 Adding that Athlone had become a ‘vibrant, progressive town’, Cllr. Keena welcomed the fact that Athlone has been chosen as a Regional Growth Centre within the NPF 2040. ‘As Mayor I will be to the forefront in leading this district to identify key public infrastructural projects that will drive further economic development in this area. In doing this I will be looking for closer working collaboration between IDA Ireland and this Municipal District. We need to be briefed on an ongoing basis on what is required from our end to attract further industries to this region’, he told the Chamber.